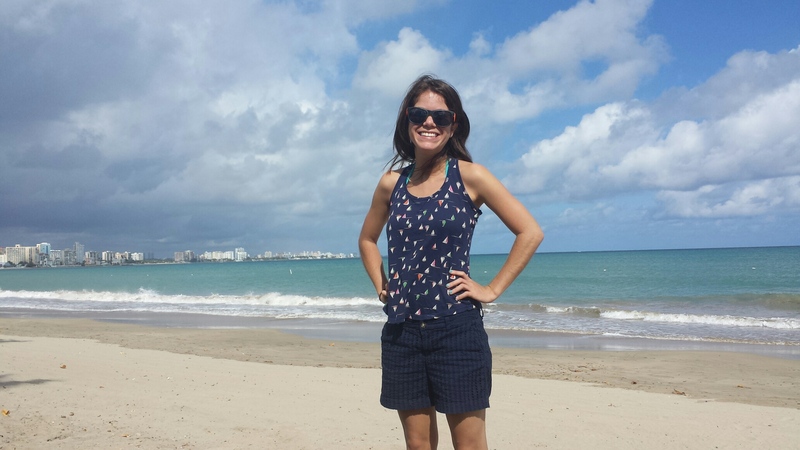 Today we have the honor of getting to know Melissa Marquez, a marine biologist, most famous for her work with sharks! Melissa Cristina Marquez is a Latina marine biologist and wildlife educator with a BA (Hons) in Marine Ecology and Conservation degree from New College of Florida, USA and an MSc in Marine Biology from Victoria University of Wellington, NZ. Marquez currently resides in Sydney, Australia. 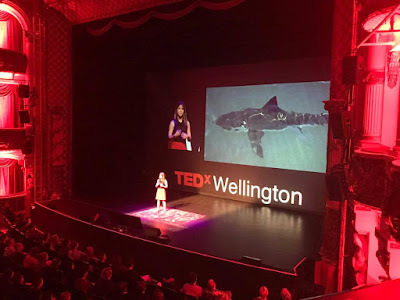 She is a freelance environmental contributor, wildlife artist, aspiring children's book author, and founder of The Fins United Initiative (TFUI; www.finsunited.co.nz), a program that brings attention to the unusual and diverse sharks (and their relatives) of the world and the threats they face. Marquez is also host of the Spanish marine conservation podcast, ConCiencia Azul. You can follow her adventures around the world on Twitter (@mcmsharksxx). Question 1: At what age did you become interested in sharks? Were they always a passion of yours? MM: I grew up watching David Attenborough documentaries and The Wild Thornberry’s on Nickelodeon. When I moved to the USA from Mexico I got to watch Shark Week for the first time and became hooked on sharks! My first love was manatees, though… but they just didn’t end up exciting me as much as Chondrichthyans (sharks, skates, rays, and chimaeras). Question 2: Did you have any professionals or family members who served as role models when you were younger? Do you still have any now? MM: People like David Attenborough, Sylvia Earle, and Eugenie Clark are big role models I’ve looked up to. Now, while those three have been instrumental to my pursuing of marine biology, I also have colleagues that I also look to as role models. 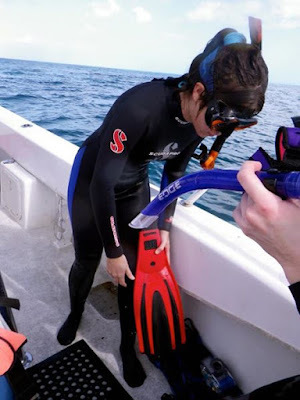 Melissa gearing up for a shark dive in the Bahamas. Question 4: Was there anything you did or learned as you were on your way to your current career that you feel got you to where you are? By this I mean any sort of field experience, a class, networking with the right people, or possibly something different or all three? MM: I think networking is the best skill I’m using and is allowing me many of the opportunities I’m getting today. Of course everyone needs to take advantage of field experiences (such as internships) and take certain classes (I recommend learning R-programming and ArcGIS for an edge in graduate school). But networking is an art and can be hard to do! I talk about networking tips that worked for me in these three (One, Two, Three) articles for my #STEMSaturdays series with femSTEM. Question 5: Is the field of marine biology different now than from when you started as far as you can tell? How about from when you were a child? MM: I don’t think it has changed in that you still have passionate scientists trying to unravel the mysteries of this massive ecosystem that sustains our planet. If anything, it has changed for the better—programs like Blue Planet have brought the magic of the ocean to everyone’s fingertips and has inspired many to come study and help protect the ocean. One of my favorite TEDx Talks was Melissa's about the representation of female scientists in marine biology. Question 6: What was or is your favorite professional experience so far? Would you be able to tell us about some of your current projects? · The Fins United Initiative is a shark, skate, ray and chimaera education and conservation program aiming to unite fin lovers worldwide. Through partnerships with K-12th grade educational institutions, The Fins United Initiative provides easy-to-access materials that educators can use in their classrooms. · Little Fin Fighters: A collaboration between the organisation Keep Fin Alive and The Fins United Initiative in educating younger generations about plastic pollution and how to reduce their plastic pollution footprint. 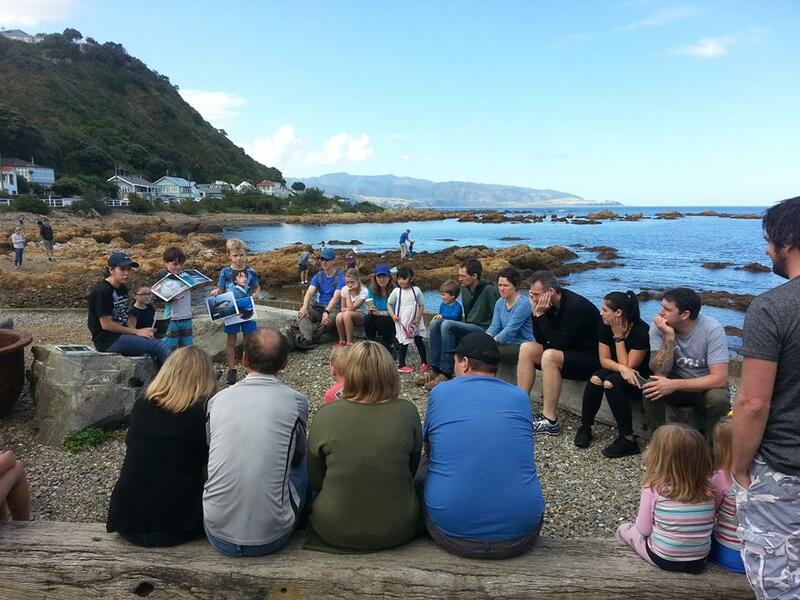 · Shark Bites Book Club: The Fins United Initiative is proudly teaming up with authors around the world to introduce The Shark Bites Book Club to promote and encourage science literacy in all ages. · ConCiencia Azul: The Spanish version of Speak Up For Blue Podcast. 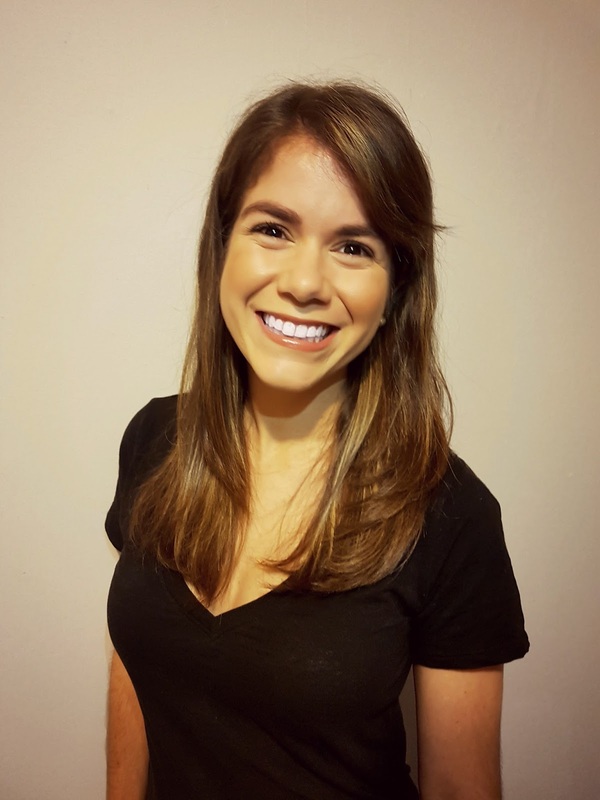 ConCiencia Azul interviews Latinx* marine science researchers and we discuss ocean-related topics, as well as speak about some of the unique hardships Hispanic/Latinx countries face. The show will post a new episode once a week starting February 2018. // *Note: Latinx is a gender neutral term often used in lieu of Latino or Latina. · Writing efforts: This upcoming year, in-between my jobs, I will be putting much of my effort into becoming an author and writing books that will help promote and encourage science literacy in all ages. Question 7: You have traveled to a lot of interesting places around the world for your research. What was your favorite traveling experience so far? Do you see yourself traveling more in the future? MM: I honestly can’t pick just one favourite traveling experience- they are all treasured for one reason or another. I’m fortunate enough to have traveled to over 20 countries in my short life. But I do hope I continue to get to travel in this line of work. Currently I have a conference in Malaysia in June lined up; I may go to another conference in Brazil, too. Question 8: What is the biggest misconception about your line of work that you find people tend to believe? MM: Many people think marine biologists are constantly out at sea with animals and that just isn’t the case. Like most scientists, we spend a fair bit amount of time inside (writing, analysis of data, doing research, applying for funding grants, etc). Question 9: How much of your work takes place in the field with the animals vs. in a lab setting? 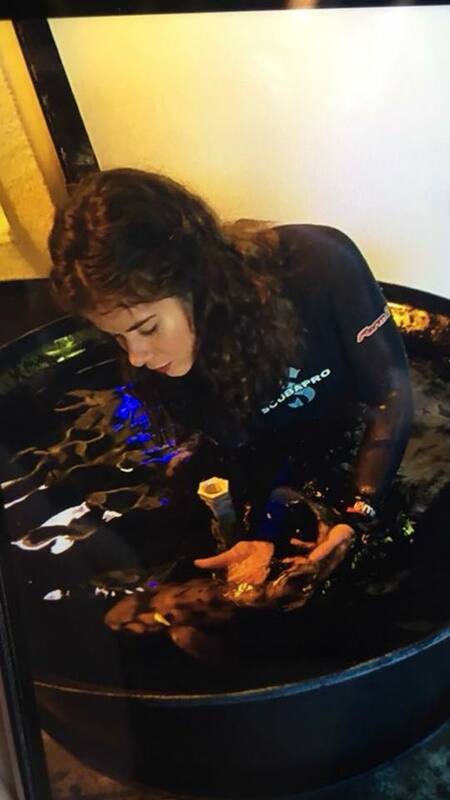 MM: The majority of my time is spent behind a computer analyzing data and creating science outreach materials for The Fins United Initiative. Field work is usually in batches of “seasons” and depending what you are studying, your time in one place (be it the lab, field, or at a computer) varies. Melissa out on a boat, on another collection trip. Question 10: Was there anything about your career that you had to learn/do that you were not expecting? How did you conquer it? MM: I was definitely not expecting how isolating some of the work can be! But that’s just the nature of our work, at times. You learn to be the best company to yourself, haha. Question 11: Do you ever get criticized on any of your work or for what you do? How do you handle it? MM: Of course! I’m big on journalists using the correct terminology when they cover fatal shark encounters (and will call them out on using inflammatory language such as “shark attack,” “man-eating monster,” or “terrifying killing machines”). This has gotten a lot of ire from the certain people in the public who turn their anger at the situation to me. I’ve gotten death threats and told that they wished I was the next person to die from a shark bite. At first I was really shocked by the viciousness of people but I’ve developed some thick skin over the years. If I truly am getting harassed or feel like I’m in danger, I don’t have second thoughts on reporting the person. Question 12: Do you ever work with aquariums? If so, in what capacity? MM: I’ve worked with aquariums in the past as someone who helps take care of the elasmobranchs in the facility. Feeding them, mainly. You can see the one of my elasmobranchs in New Zealand on the cover of SMORE magazine. 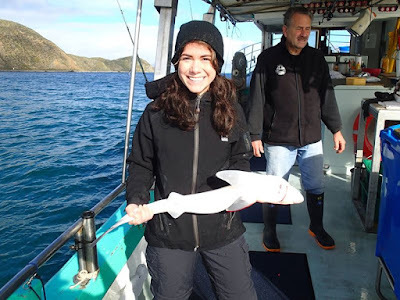 Melissa handling a carpet shark (Cephaloscyllium isabellum) in New Zealand. 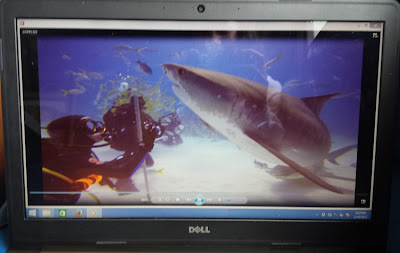 Question 13: One of my favorite things about what you do is that while you do great scientific work, at the same time you are constantly communicating with more general audiences, as well, to actively dispel lots of stigmas attached to sharks and their relatives. What are some of the most common misconceptions that people have about sharks that you wish would disappear? MM: My main two would be this: sharks intentionally eat people and sharks don’t get cancer. First, “rogue sharks” (a shark that has a taste for human flesh) are not real and no scientific evidence backs their existence. We are not on the menu for sharks! Secondly, there are many documented observations of sharks that have growths (possible tumors) on their bodies. They have fantastic immune systems but as susceptible diseases like cancer regardless. Melissa holding a spiny dogfish after a collection trip for the aquarium she worked at. Question 14: You are most famous for your work with Sharks and their relatives, rays, skates, and chimeras. 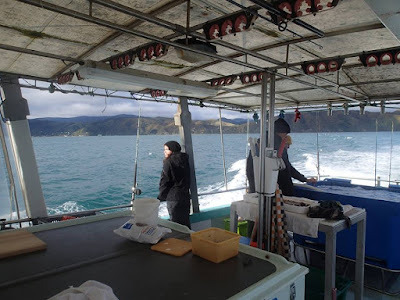 Do you have experience working with any other kinds of marine life? What about land animals? MM: I do! In the past I’ve been lucky enough to work with dolphins, whales, manatees, otters, and a variety of other marine life. While interning in Belize I was also in charge of a slew of jungle animals- including ocelots! Question 15: Are there any species that you want to work with that you have not worked with before? MM: Plenty! I would love to work with mako sharks, oceanic white tips, whale sharks, thresher sharks, more deep sea sharks… the list goes on! MM: The tiger shark (Galeocerdo cuvier) is hands down my favourite animal. No competition. I’ve been face-to-snout quite with them numerous times and they are just perfect in my mind. Everything from their big eyes that watch your every move down to their uniquely shaped teeth and their gorgeous pattern on their skin… I can’t get enough of them! Tiger sharks are actually what sparked me to open my Etsy store that focuses on shark patterns- to showcase their beauty without the distraction of teeth. Melissa up close and personal with a tiger shark (Galeocerdo cuvier) in the Bahamas. Question 17: Why should preserving endangered marine life and their ecosystems be important to the everyday person? MM: The marine ecosystem covers the majority of our planet yet we know so little about it and are destroying it! We need to remind people that their actions, especially those near the coasts, affects the ocean. And if you harm the ocean, well that affects everyone, even if those people live far from the ocean. The Gulf of Mexico dead zone (spread from fertilizer going down the Mississippi) is a good example of this! Question 18: What can we all do to help preserve marine ecosystems? 2. Reduce your plastic pollution footprint (reduce, reuse, recycle). 3. Help educate others about why the marine ecosystem is important. 4. Donate to NGOs and other charities (or research facilities) to help support marine science research! Melissa on the beach in her native Puerto Rico. Question 19: What would your advice be to anyone trying to make a career in marine biology (or science in general for that matter) now? MM: To follow your passion! You may get people in your life that tell you that you shouldn’t pursue marine biology (or science) but if that’s what fires you up then GO FOR IT. It’s your life and you should live it the way you want to, regardless of other’s opinions. Education-wise, I suggest to many scientists to take computer programming/language classes (being well versed in R or foreign languages if great to have), make sure to take a few writing classes and to always take the required science and maths! MM: I just moved to Australia, so my husband and I love going for hikes around the Sydney area to check out our new home! We’re excited to get a car and go on road trips, too. I’m a runner, love scuba diving, and like to cook as well. During my down time you can always find me reading.